Russian Prime Minister Dmitry Medvedev. During his speech at the Gaidar Economic Forum in Moscow on January 13 Russian Prime Minister Dmitry Medvedev called the previous year the most difficult in Russia's recent economic history. However, in his words, the country withstood a drastic decrease in oil and gas prices and has already taken the first steps towards exiting from the crisis. In particular, Russian metallurgists have already become the most effective in the world in terms of production costs. The Russian economy had never faced so many different challenges simultaneously, including the fall in oil prices, anti-Russian sanctions and the change in the global economy's working principles, said Russian Prime Minister Dmitry Medvedev.“In such a situation traditional recipes stop working and the usual regulating instruments fail,” he said. However, in Medvedev’s words, the world economy also found itself in a complex situation and problems have caught up not only with resource producers but consumers as well. In particular, the supply on the oil market significantly outweighs the demand, while the political situation in the Middle East no longer influences the level of oil prices as it did before. 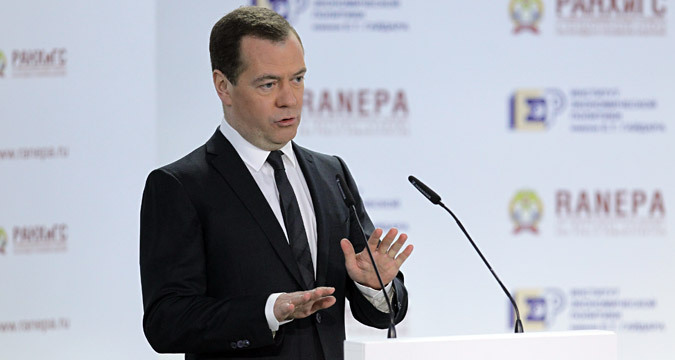 Medvedev says that in the last year many rules in the world economy have changed. “The established regulations are corrected and rewritten, as was done by the International Monetary Fund (IMF) in relation to Ukraine,” Medvedev said. He was referring to the fact that the IMF decided to continue lending money to the Ukrainian economy despite the country's default on its Russian loan. “The economic sanctions against Russia undermine the WTO, while decisions made by one country immediately have an impact on other countries without any time lags,” he said. According to the prime minister, in this situation Russia's shortage of economic growth sources have increased. One of the main consequences of the economic crisis in Russia, according to Medvedev, is the population's income decline. “In the end it was the middle class that suffered. Over the last 12 years we had been successful in rooting out poverty. Sometimes we worked to the detriment of structural reforms and the super-revenues from oil production were used for pensions and building hospitals,” he said. As a result, according to Medvedev, in the previous period the growth of prosperity outstripped modernization and poverty decreased twofold. The prime minister remarked that even though the situation in the Russian economy is complex, it is still manageable. “The flight from the ruble did not occur. The banking sector is working stably. Credit activity is gradually increasing,” he added. However, in Medvedev's view, if oil prices continue to fall, the government will have to change the parameters of the annual state budget. “The basic principle of our policy must remain the same - we must live within our means.” In particular, he mentioned that the fall of the ruble resulting from the decline in oil prices has led to the reduction of Russian companies' expenses. “Russian metallurgical companies have already become leaders in terms of cost indicators, which are one of the lowest in the world,” he continued. “The agricultural sector is also demonstrating stable growth.” In Medvedev's words, Russia's economy has shown its resilience, but the main result is that, "the country is withstanding the lack of substantial oil and gas revenues.” In such a situation Russia is ready to improve relations with the EU and conclude new trade agreements with other countries and associations, based on WTO principles. “I am convinced of what I have already said on many occasions, that sanctions will remain in the past, but for this to happen the sides must make compromises,” Medvedev concluded.